Keeping your children safe is your number one priority and everyone knows that. As a mother I know how hard it is to keep an eye on your baby at all times, especially if you have more than one child. Almost 100,000 children under the age of 5 years old are admitted to emergency rooms for falling down stairs each year according to CBS News.That is a terrifying number! If you have stairs in your home, or even a couple of steps, you need to make sure that they’re blocked at all times so that your baby can’t get up or down them without your supervision. In this article I’ll review the best baby gate for top of stairs, that I think is the safest and most durable. Why The Top Of The Stairs? No mother wants to hear the dreaded ‘thump’, the sound of your baby falling. And if you have stairs in your home, hearing that sound will make your heart stop. That’s why I recommend getting a baby gate for the top of the stairs as well as the bottom. Babies are naturally curious. They want to explore this amazing new world they’re in and the new found independence they have because they are now crawling, scooting, walking, etc. And if you think you have time before you have to worry about getting a gate, think again. Once your baby starts to get mobile it won’t take long for them to start pulling up and mastering new motor skills. Having a baby gate at the top of the stairs will ensure that your baby can’t fall down them, either on their own (walking, crawling, etc.) or in a walker. According to WebMD 16% of the 100,000 children that fell down the stairs were in a walker. Is this a high traffic area? If so, you want to make sure that you can get through it easily, especially if you are going to be carrying anything (i.e. laundry, larger toys, even your baby). So getting a gate with a wider walk through space would be more suitable for your home. Another feature that would help in a high traffic location is a one handed opening latch. That way you can quickly get through the gate without having to put anything down. Installing a baby gate at the top of the stairs must be mounted to the banister or wall. 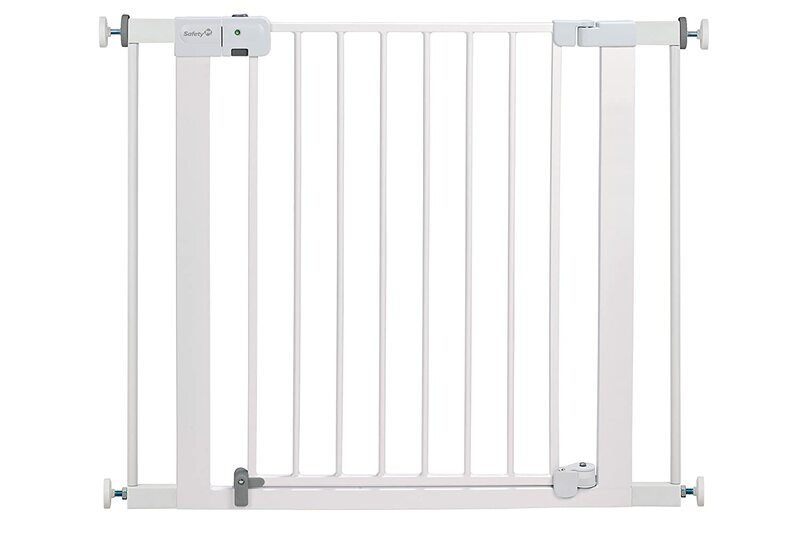 Baby gates that don’t mount, such as expandable gates, can lose their stability overtime and eventually be pushed forward or pulled backwards. Below are the top 5 baby gates that I found for the top of the stairs. We’ll go over the benefits and restrictions each gate has and then I’ll let you know the gate I’m most likely to buy. The Munchkin Loft Aluminum Gate can be installed on uneven surfaces using it’s Integrated Tuning System and can be expanded or retracted to fit most doorways. The mounting includes a quick release mechanism so that you can remove it quickly if you need to without having to unscrew the mounts from the walls. It has a childproof double locking mechanism for added security and can swing open in both directions for easier access. However, if you have handrails on your stairs it can make the installation difficult. 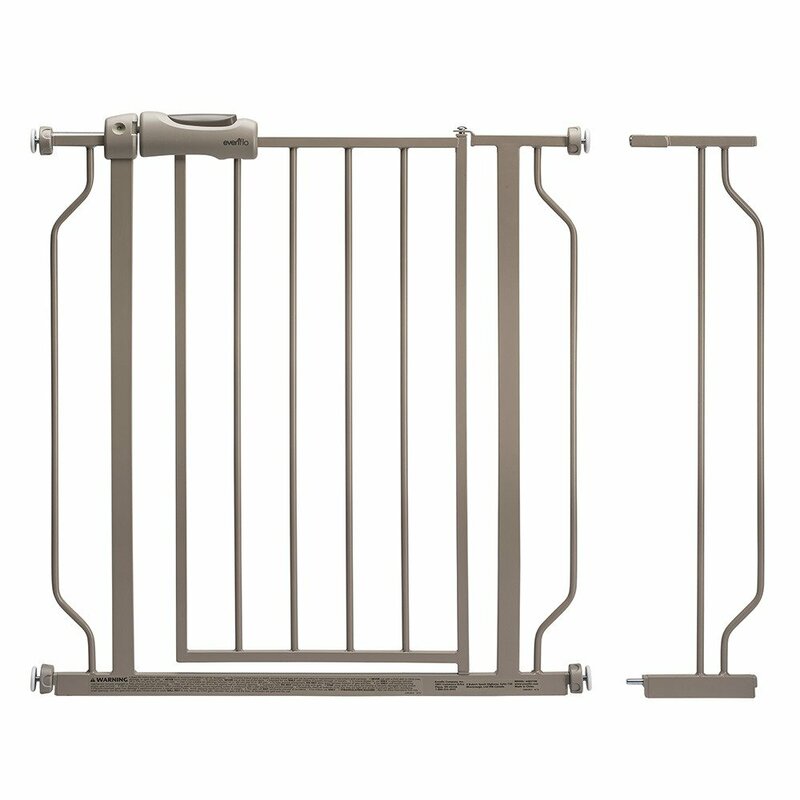 This is not a one-piece gate, meaning each wall mount must be installed separately, which can also make installation a little more difficult. The latch to remove the gate can get stuck making it difficult to take down. This gate has a larger walk through panel of 25.5” wide, which makes it easier to get through without any hassle. It also has an easy one handed latch for opening and comes with astay-open feature, which will come in handy when baby is asleep and you start your laundry marathon. This gate comes with an added security feature of a childproof double locking mechanism which adds peace of mind if you have a more curious baby. 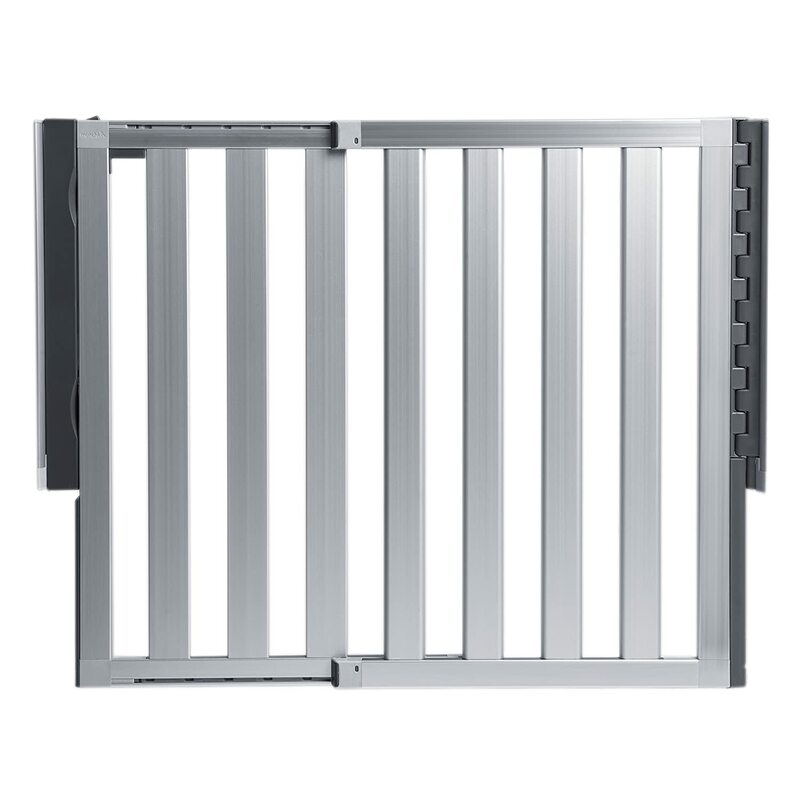 You can even mount this gate to straight walls as well as angled walls using the pivot points on the gate. Because of the double locking mechanism this gate can be difficult to open. This gate also has a lip cross the bottom of the walk through area. This can cause someone to trip if they’re not aware that it’s there or if they don’t see it while carrying something. Also the positioning of the lower mounts on the gate can make installation difficult if you have baseboards. Having a tall gate makes it difficult for babies to climb over, even as they get older. This baby gate is made of all steel and is known for it’s quick installation and removal. It has a one handed latch which allows you to walk through while your hands are full. This gate even comes with a 6” extension. However, this gate is only easy to take down if used in expandable form (see above why I think that isn’t a good idea). It only has 16” of walk through space which is not very much room, especially if you’re carrying something. And adding the 6” extension could make the gate less stable. This gate has an easy to open latch for adults. But requires 2 points to be pushed at one time so it’s difficult for children to open. You only have to give this gate a gentle push to close due to it’s slam-latch feature. It has a red-green lock indicator which will let you know with a quick glance if the gate is closed securely. You can adjust the swing of the gate so that it doesn’t open over the stairs which could cause you to be imbalanced and result in a fall. However, the 2 push system to unlock the gate can be difficult and has been known to pinch fingers while trying to do the second push. The metal used for this gate is thinner. Meaning continual leaning or pushing on this gate could cause the bars to weaken causing it to bend. This is a pressure mounted gate which can become unstable over time especially if leaned orpushed on repeatedly. I recommend mounting (screwing) baby gates to the wall or banister. This gate also has a lip across the bottom which could cause someone to trip and fall. This gate has a magnetic locking system for a smoother and quieter close. You can open the gate with the one handed opening mechanism. It has SecureTech handles that lets you see with a quick glance that the gate is securely closed. However, overtime magnetic locks can become weak which means the gate won’t close securely or stay securely locked. This gate only stands 28” high. Not having a tall gate is something that I can get past, but this is a short gate. This is also a pressure mounted gate, which means there’s no guarantee of stability after a while. 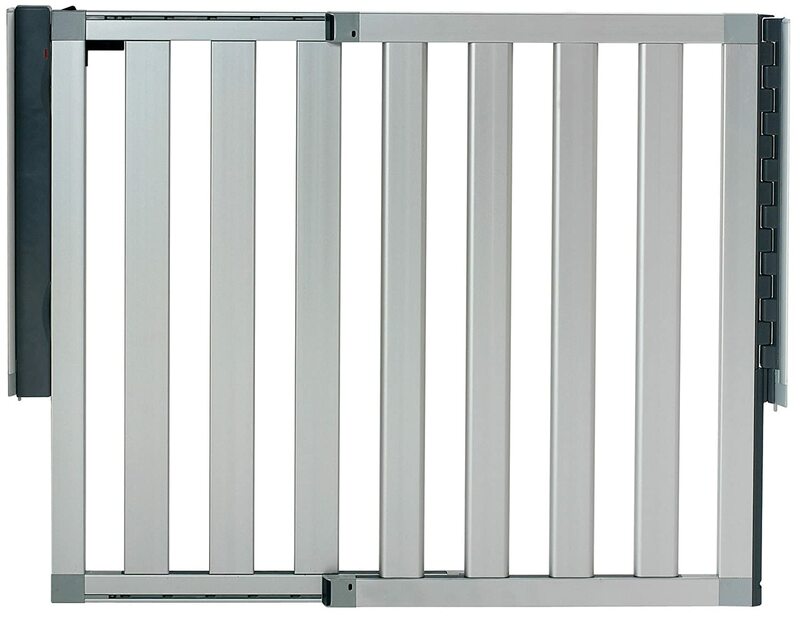 After going through the comparisons, the best baby gate for top of stairs is the Munchkin Loft Aluminum Gate. In my house once we install a baby gate it won’t be removed for a very long time, so I’m not worried about having to detach it or fret about trying to install it more than once. So installing it (i.e screwing it into the walls) won’t be a problem. Compared to the other gates it appears to be more durable once installed and easier to open, even with the double lock. 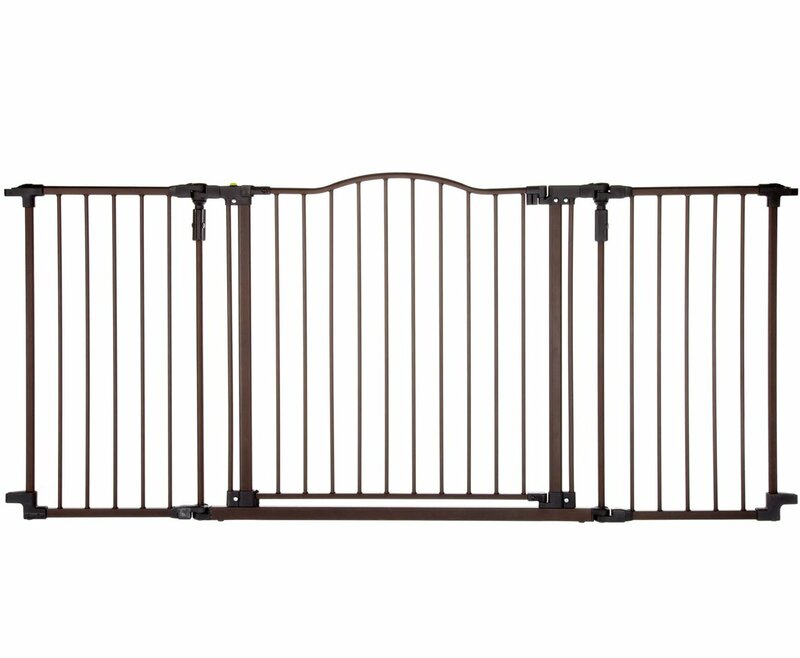 Since I will be installing this gate at the top of my stairs I don’t want a gate that has a lip or anything that can be tripped over going down the stairs. This gate isn’t a one piece setup and I’m ok with that. It has more potential to actually reach it’s 40” in width and hold its stability. Other than some other gates that say it reached but becomes weaker the wider you make it.When choosing a baby gate for your stairs make sure you are doing plenty of research and comparisons. Safety isn’t something you want to guess or practice with trial and error.